There are two theaters in the Branson Mall complex on Hwy 76, plus the Center Stage area where performers perform most of the day every day. That's a lot of music going on. The larger of the two-theaters in the mall houses several shows daily and seats a few hundred. That one is the Branson Mall Music Theater. Bill Brooks used to joke that this theater was the only one in America with a Wal-Mart in the lobby. Right across the hall is the Branson Hall of Fame Theater where some smaller shows can have an intimate gathering of their audiences. One such show located here is a one-man show called "Fly Me To The Moon" featuring Ralph Kuster. I visited Ralph Friday morning for a ninety minute presentation of some great old songs, as the show title suggests. Ralph is a pleasant fellow, dressed in a tux, who sings well and moves gracefully on sgage as he sings the old familiar songs of yesteryear. 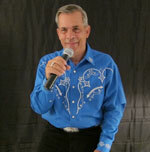 Songs such as "Young At Heart", "Ramblin' Rose" and Perry Como's "And I Love You So." Also on the program is a couple of Eddie Arnold hits "You Don't Know Me" and "Make The World Go Away." I enjoyed Ralph's version of "Once Upon A Time" and Gene Kelly's "Singing In The Rain." And I learned some musical history Friday morning. Remember the old song "Would You Like To Swing On A Star?" I'll be you do. The lyric talks about how "You might grow up to be a mule...or a pig." Cute song from long ago. Well, Bing Crosby recorded that song with the help of a young quartet of brothers....the Williams Brothers. One of which was our own (and very young) Andy Williams. If you enjoy the old songs sung in a style we remember, you'll like Ralph Kuster. Ralph is a Canadian who is in his third year of performing here in Branson and like many neweer and smaller shows, has the difficult task of building an audience. I'd like to see our area folks get behind Ralph and support him in his musical efforts. He not only deserves our support, but we just don't want this year to become known as Kuster's last stand, now do we? Showtimes is 10 a.m. Tuesday through Saturday. For more information call 334-5412. Ralph Kuster catered his show to the Harrison Red Hat Ladies Club Aug. 23 at the Imaginary Theater on Gretna and Roark Road. Kuster, a Canadian native, began perfoming in Branson last spring. 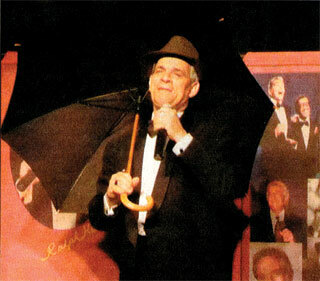 Kuster plays to the audience while he pursues his lifelong dream of being a singer. To find some of the talents in Branson, a person has to look in some of the less ornate places. Ralph Kuster, a Canadian native, came to Branson this past spring to continue his pursuit of a lifetime dream of being a singer. As a teenager, Kuster played in high school musicals and became fascinated with singing and performing before live audiences. It took him a long time before he was able to pursue his dream. In 2003, Kuster was given an opportunity of a lifetime. He was allowed to sing on a Canadian variety show. Since that time, Kuster has produced several CDs of his own. Last month he performed before a Canadian audience of over 2,000 people. 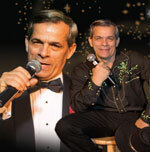 He has his own style of singing songs made famous by the Rat Pack, Elvis Presley, Johnny Cash and many others. One of his most incredible performances is when he sings What A Wonderful World, and imitating Louis Armstrong, flawlessly. Another song Kuster sings to perfection is Welcome To My World, by Eddy Arnold. 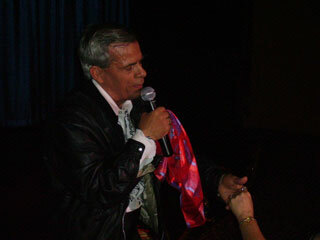 Kuster has a unique style of delivering the songs he holds dear to make them memorable for his audience. He is an articulate and witty entertainer. This one man show will keep his audience alert with surprises throughout the show. This Canadian marvel performs in the intimate setting at the The Imaginary Theater located on the corner of Gretna and Roark Road. The audiences here are not as grand as Canada last month, but it is where Kuster has found a home. It is a place where audience members will be warmed by his humble spirit and cheered by mere joy of performing. For more information regarding the Ralph Kuster Show or purchase tickets, contact the Imaginary Theater at 332-1911. Copied with permission from the Branson Daily Independent newspaper.